Summer is fast approaching and now is the time to eat your way to a sexier, cellulite free body. Over 80% of the female population, over the age of 30 suffer with cellulite, so don’t feel like you are the only one going through this. There are a number of ways to help reduce cellulite, however the best way is to prevent it. Once you have cellulite, it is very difficult to get rid of it. Cellulite is caused by the fibrous collagen which makes up the connective tissue below the surface of the skin. As we get older, we lose the elasticity within the collagen fibres and this causes small gaps to appear. The fat which is just below the connective tissue protrudes through these gaps and causes your skin to look like cottage cheese or orange peel, this is cellulite. It is already well known that drinking plenty of water will help you remain fit and healthy, but did you know that drinking enough water can help reduce your cellulite. Eating water is actually better than drinking it when it comes to helping your cellulite. Not only is the water, contained in watermelon, enriched with vitamins and minerals, it is also absorbed quicker in the body than chugging a glass of water. The water in such fruits and vegetables like cucumber and watermelon can help to fill you up, reduce your appetite and help aid in weight loss. The less fat you have in your body, the less likely you are to have cellulite. Consuming fruit which has a high water content improves your skin hydration. Having healthy and hydrated skin can reduce your cellulite and can help your skin cells to perform at their peak strength and prevent skin dimpling. There are a number of fruit and vegetables high in water, these include; Tomatoes, spinach, lettuce, carrots, grapefruit, oranges and broccoli. However, cucumber and watermelon are the best as there is over 97% of water found within these delicious gifts from Mother Nature. Fish oils are an excellent source of amino acids. Amino acids are essential for ensuring a healthy body. Amino acids are the foundation of protein and protein is what collagen is made up of, so the more protein and amino acids that you can get into your body, the less cellulite you will develop. In addition, amino acids help to strengthen cell membranes and attract water into the cells, meaning that your cells will remain plump and hydrated. Protein is perfect when trying to lose weight as it keeps you fuller for longer and can keep your blood sugar levels at a constant, meaning that you will have less need for snacking throughout the day and less need for a sugar boost. If you have lower levels of fat in your body, you are less likely to have cellulite. Losing weight and eating a high amino acid diet can be extremely effective as the less fat you have in your body and the more muscle, then this can help with the appearance of cellulite. Another great element found in fish oil is essential fatty acids. Essential fatty acids help to keep the cells hydrated and watertight which reduces cellulite. There has been some extensive research to show that consuming white tea can help with the reduction of cellulite. White tea slows the breakdown of elastin and collagen, which both play a vital role in upholding healthy skin as well as preventing cellulite. The key to preventing and reducing cellulite is keeping the layer of connective tissue within your skin in tip top condition as well as thick. Having thick and healthy connective tissue stops the fat from protruding out, creating the dimpling effect that we know as cellulite. 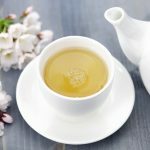 White tea is also a great source of antioxidants as well an effective anti-inflammatory, which both help to reduce and prevent cellulite. Additional proteins include; beans, lean/fat free red meat, fish, cheese and eggs. No ladies, chocolate covered Brazil nuts do not count! Brazil nuts have extremely high levels of Selenium. Selenium is an essential mineral which is perfect for protecting and maintaining the quality of your skin as well as its elasticity. Selenium is used in the body to create selenoproteins which have a similar job to antioxidants, preventing cell damage caused by free-radicals in the body. By stopping this cell damage, they are also reducing the appearance of cellulite and even preventing it from occurring in the first place. There are a number of foods which you can eat that also contain a high level of selenium, these are; tuna, crab, kidney and even lobster. Pineapple contains high levels of vitamin K which improves circulation within the body, this vitamin is vital for retaining healthy skin. Pineapple also contains vitamin c which is essential in stimulating the production of collagen and finally, pineapple contains bromelain which is a collection of enzymes that have effective anti-inflammatory properties. All of these enzymes and vitamins are perfect for the reduction and prevention of cellulite. These 5 superfoods are perfect to help you look your best on your holidays and all year round, so get eating now but remember, all in moderation.